Located on nearly one acre, the lush tropical vegetation provides complete privacy for this 4,200 sq ft ocean front home. Hawaii regulations require a 30 day rental period. Please send us an inquiry about the dates that would work for your next trip to the North Shore even if you are planning to spend a week or a month as we can accommodate your time frame and needs. In this spectacular home the glass doors slide away to open the interior to the lanai and pool area to provide true indoor/outdoor living. With two kitchens, dining at home may be prefered to going out. The pool side Lanai makes entertaining by the ocean a breeze and the Kitchen/Dinning room has spectacular views of the North Shore coast. The media room provides entertainment for those that want to take in a movie while leaving the rest of the home tranquil. All bedrooms are spacious and offer decks and ocean, garden or mountain views. Swim with sea turtles and tropical fish off the white sand beach in reef protected waters directly in front of your lanai. All the amenities of a luxury home with granite counters, natural stone floors and fine teak furnishings make for an wonderful vacation in a rare, peaceful and private Hawaiian paradise. Historic Haleiwa Town: Haleiwa is a wonderful historic Hawaiian town, which is considered the beginning of the North Shore. In Haleiwa you can enjoy shopping, a shave ice, set up a fishing charter, jet ski, stand up paddle, surf, scuba, swim with the sharks or take a snorkeling tour. There are also wonderful restaurants with views of the harbor and the amazing North Shore sunset. World Class Water Sports: The North Shore is the ultimate destination to witness world class big wave surfing. Bonzai Pipeline, Sunset Beach and Waimea Bay are are located within the seven mile miracle know as the North Shore. From the Lanai of your vacation home you can see Tow-In surfers tackel 20 to 30 foot big waves when the swells roll in in the winter. Don't worry even when the waves are huge the reef breaks them down to gentle one foot bumps that roll up on the sand. Amazing Kite and wind surfers can be found doing their high flying manuvers just down the road. Waialua - From Sugar Plantation to Pristine Coast: Today the little town of Waialua is home to dozens of small coffee and tropical fruit farms that stretch to the majestic mountains. Along the pristine white sand beachs are single family homes on large beach front parcels and your vacation home sits among them. Accross the street are fields. No hotels, no traffic, just the sound of the birds and the waves. The historical sugermill is a half mile away with local craftsmen and a farmer's market for all the locally grown produce and unique hawaiian crafts. I enjoy making this home a perfect second home for my family and I enjoy having guests see it as their second home as well. I believe in life balance and our time in Hawaii gives me that relaxation, play and recharge I need to return to my work as psychologist. I enjoy kayaking, standup paddle boarding, biking surfing and swimming with the sea turtles in between home improvement projects when I am staying in our Hawaii home. Read the reviews and you will understand that this property is very special. 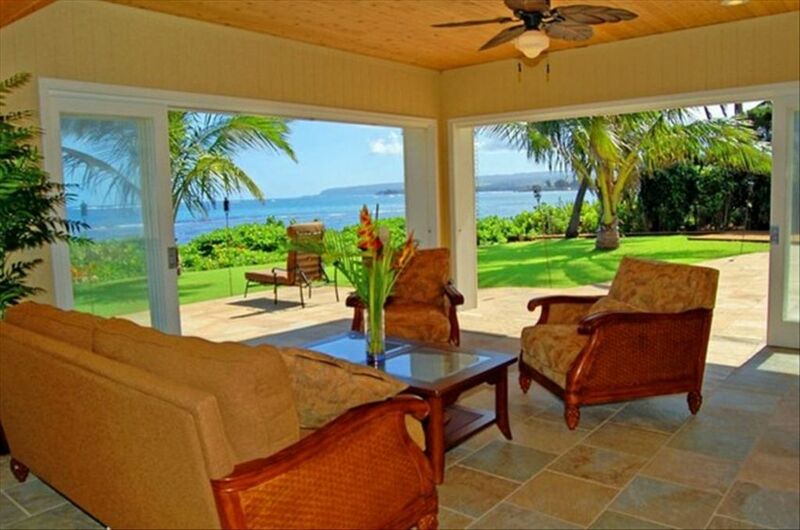 It is rare to find such a large home on a very private beach within two miles of the center of the North Shore - Haleiwa. Two kitchens, private pool with a Tiki Bar and a media room are a few of the special features you will enjoy with just your family or friends. Take a look at the pictures to make sure this is the home you want to spend your next Hawaiian vacation in. Four bedrooms with three bathrooms on second floor and one bathroom and outside shower downstairs. Garden View from the entry of beautiful Hawaiian Mountains and manicured grounds. 100 feet of white sand ocean front on nearly one acre tropical estate. Upstairs with Ocean view Lanai and an indoor/outdoor living room downstairs pool side. There are several Dinning areas both upstairs and downstairs. A main teak dinning table in the upstairs dinning area is adjacent to the second story lanai. Lush grounds with lawn areas front and beach side. Wrap around second floor Deck with seating for 180 degree ocean and coastline views. One Double and two single Kayaks plus Stand Up Paddle Boards, boogie and surf boards available to rent. Wrap around second floor deck on second floor. Beach Side private Pool with Cabana, Indoor/Outdoor Lanai with full second kitchen and poolside dinning. New Tiki Bar between Pool and the beach with for Pool Side entertaining. Beach View: Endless white sand beach views, 100 feet of white sand ocean front on nearly one acre estate. Mountain View: Garden View from the entry of beautiful Hawaiian Mountains and manicured grounds. Cable/Satellite TV (2) : Media Room with 8 foot HD projection TV, Second Cable TV in Living Room. Private Pool: Beach Side private Pool with Cabana, Indoor/Outdoor Lanai with second kitchen and poolside dinning. Full Luxury Kitchen with all amenities, granite counters upstairs and Second Kitchen with Pool Side Dinning on first floor. Deck/Patio: Two large ground floor decks surrounding private pool and indoor/outdoor lanai and kitchen. Balcony: Wrap around second floor Deck with seating for 180 degree ocean and coastline views. Handicapped Accessible (may have limitations): Ground floor has full Kitchen and living convertable beds in Media Room and a bathroom that is not wheel chair accessible. Boardwalk to the Beach from the pool deck with one step to the sand. We loved this home and it's location. There were beautiful sunrises and sunsets on the comfy furniture just outside of the living room and kitchen. We spent a lot of time in the pool with the pool float toys and enjoyed the outdoor area very much. The beach is steps away from the back yard. We enjoyed the kayak and paddle boards in the ocean. The grounds are very well kept. Our house hosts, Shawn and Enza were so accommodating. They were there if we needed anything at all and just couldn't have been nicer. The home had everything we needed. The bedrooms well furnished and bathrooms were well stocked with towels and soap. The kitchen had plenty of supplies for cooking which we did several nights. The towns around us were fun to explore and had everything we needed with fun shopping and restaurants. We would most definitely stay here again. It is great to hear about your experience. Shawn and Enza spend hours working on improvements to our home before you arrived and it sounds like their effort paid off. We always want to exceed our guests expectations and it is good to know your would "most definitely stay here again" You are the third guest in a row who has said they would return again which is exactly what we want to hear. We will keep striving to make our home the perfect destination for those that want a special Hawaiian vacation with family and friends. This home has a beautiful location. We were fortunate to see whales daily right off of the beach, and have turtles visit often too. One turtle stayed on the beach for hours! The exterior of the home could use a bit of paint and and the waterfall at the pool area was not running/working but otherwise I think it was as pictured on the site. Inside, we did expect the 4 bed/ 4 bath combo to better accommodate 4 couples, but one bathroom is downstairs away from the bedrooms. It wasn’t a big issue, but don’t expect each bedroom to have ensuite bathrooms. The home managers are a delightful couple that truly want for you to have a wonderful, comfortable stay, and they are very accessible , living only a few houses away. The kitchen is well appointed and the beds are comfortable. The home was clean and fresh when we arrived, and the breeze that flows through the home keeps the temps inside very comfortable. There are plenty of chairs around the pool and near the beach. There is a kayak that we used and paddle boards that we did not use, but appeared to be in good condition. This home is well stocked with plenty to do and stay entertained. We would stay in this home again if we were to return to Oahu. The house and property were ideal for us - four couples who wanted communal time and individual time (plenty of places to be off by oneself). Each couple had a large bed and a separate bathroom with a lovely shower. The house (more like a very large upscale cottage) is perhaps a 100 feet from the sea and the never-ceasing lullaby of waves breaking near shore. The beach is sandy above the waterline, but underwater rocks and coral make it advisable to bring rock shoes if you wish to swim in the surf. The furnishings in the house were suitable for a casual environment near the beach. The neighborhood was quiet with almost no traffic on the street at the back of the house. The caretakers were respectful of our privacy and responsive to our request for a few kitchen tools (we asked for a garlic press, hand-held juicer and knife sharper in the evening and received them next morning). In summary, I recommend this property for those wishing some down time. I would return. We had a wonderful time in this beautiful home! The whole house was perfect. Everything that we could possibly need was provided, from the piles of fresh towels to the well stocked kitchen. We loved the wrap around deck and everyone would wander out to the beach view in the morning with their breakfast or morning coffee! The kids loved the pool as well asthe beach and spent hours in it or snorkling in the ocean, fishing,walking the beach looking for treasures, or just sitting and watching the waves coming and going!Turtles came up on the beach to sleep during the the day and we watched whales surface and dive. Shawn and Enza were great hosts and we really enjoyed meeting them . It was great having someone to call if we needed anything. Everyone of our group of eleven people would love to come back Thanks !!! I am thrilled to hear about your experience in our home. It is good to hear that you had everything you "could possibly need". This month we are taking the time to refresh our home and I am looking forward to the feedback with get from our next guests. We rented this home for a once in a lifetime experience for us and our two young boys (2 and 4). It was originally supposed to be a larger group of family but ended up being only us. We had talked about the price of the home and decided it looked amazing and we would go for it. Unfortunately were disappointed upon arrival. The location and view are amazing. The house is outdated and in need of repair. The photos representing the home are not an accurate description of it's current state. It needs paint inside and out, all the fixtures are dated, as is the lawn furniture, mattresses, curtains, etc. We stayed during the coldest time in years and actually needed heat only to find the fireplace in non working order. When it rained, the rain water came inside the downstairs and we had to use towels to mop it up daily. The pool area water feature no longer works. Yes, all of these things are superficial, however, if they are not going to be as advertised, then the rent should be decreased or the improvements made. The hosts were great always checking in with us and even apologized for the weather :). They are the reason for the 4 star rating because without their attentiveness, it would be a 3/5. We are taking your feedback seriously and we have scheduled two weeks in March to make repairs and complete the maintenance that needs to be done. We hope the next guest will notice the difference. This is a wonderful location and guests have often said staying in our home exceeded their expectations. We will make sure we make the improvements needed to get back to that level of satisfaction for our guests. We had a wondrful time in Waialua. The location was great, the water was beautiful, Haleiwa is such a cute down and Shawn and Enza were attentive and helpful. The house itself, however, needs a LOT of work. The electrical wasn't working in all of the rooms, the lighting in the living room/kitchen area is almost non existent so we had to hook together some lights we found to drape them over the stove to cook dinner at night. The shower in the guest bath goes between ice cold and scolding hot, so something in the plumbing definitely needs to be updated. Its a beautiful house that just needs some renovations, for the price it is being rented. We had a wonderful time but probably would not return without some renovations done. We hear you clearly and have scheduled the renovations and refresh of our home for the breaks we have coming up in February and March. New kitchenware, new decking, paint and electrical upgrades are all part of the plan. Although the issues you identified did not detract from our last two guest's experience (5 star ratings) we know that these are important improvements that we can and will make. Our goal is to exceed our guest's expectations and we hope those that stay in our home in the coming months let us know how we are doing. Waialua, North Oahu, Oahu, Hawaii, USA. 40 Minutes From Honolulu Airport. Two Miles From Haleiwa. Other Activities: Shelling, Boating, Wildlife Viewing, Basketball Court, Shopping, Kayaking. Golf: PGA Tour destination - Turtle Bay is located on the North Shore a short drive from your vacation home. Turtle Bay Resort offers all the amenities you would expect from a World Class Golf destination including fine dining, sandy beaches and terrific greens. Rates are subject to change until the deposit is paid and the booking is confirmed. Booking/Security deposits for holidays are $3,000 instead of $2,000. The one-time cleaning fee is $495. Holiday rates are higher and will be quoted upon request. A processing fee will be added if guest elects to pay by credit card through the VRBO or Homeaway payment system. There is no fee for payment by check. Hawaii regulations require a 30 day rental period so please submit your specific date request even if your stay will be less than 30 days as we may leave the remaining dates within the 30 day period vacant in order to accommodate your desired dates. Check in time is 4 PM and Check out time is 10 AM.